Come and join me and a group of other romance authors who write sweet rather than steamy romance. We have started a new group called Sweet Romance Reads. If you have a FB page, pop over and Like our Facebook page to keep up to date with all the SRR news, special offers and events. You can also follow us on Twitter to hear our news or chat with us on Goodreads. You can also find more information about the group on our website. Box sets of ebooks are all the rage right now. I have three box sets available with bundles of my books, both contemporary and paranormal. After months in limbo after Dorchester Publishing went belly up, my Magic Knot Fairies series has now been taken over by Montlake Romance, the romance publishing imprint of Amazon. The books will now be coming out again as ebooks and paperbacks. I’m also hoping they will be available as audio books. I have my fingers crossed that I will finally be able to write the rest of the series as well. If so, there will be at least two more novels and a novella to come. Check out my lovely new book cover for Warriors of Ra featuring the gorgeous Jimmy Thomas! When someone experiences a situation where their gut instinct tells them to go against everything they have been taught and ‘break the rules’, it is always interesting to see how the person, or in the case of fiction, the character, handles the experience. They have to reconcile what they thought they knew and believed with what they are compelled to do. This is often when characters grow and learn the most. Often this situation can arise when someone’s duty conflicts with their personal wishes or desires, as is the case in A Clockwork Fairytale. The young hero, Turk, has been taught a clear and uncompromising set of principles, one being that women are not trustworthy or even worthy at all. This belief falls apart when he meets the heroine and he starts to think for himself. In A Clockwork Fairytale, Turk has to go against those he considers to be his olders and betters to do the right thing, but it is a difficult decision for him to make. I love putting characters in circumstances where there is no clear right and wrong and they have to make difficult choices. A rags to riches fairytale about a lost princess and a maverick young spymaster who must foil the plans of an evil magician bent on stealing her throne. Normally only 99cents, but for two days, September 5th and 6th it’s Free on Amazon. New Contemporary Romance Coming September 24th! I’m excited to announce that my first release from Carina Press is due out on September 24th. For those who have read my other contemporary romances, I’m sure you will enjoy this story set in a small English town and the Italian Amalfi coast. As manager of the charming Greyfriar House Hotel, Melanie Marshall loves her job and spending time with her young son. But she can never forget what she ran away from: her late husband’s crimes and her own terrible guilt. Though lonely, Melanie can’t afford to let another man into her life. But when her boss, gorgeous hotel owner Jack Summers, returns from his supposed wedding without a ring or a wife, Melanie discovers there’s more to him than she ever thought. For one, the ex-soccer star is her son’s idol. But the closer she gets to Jack, the more she pulls away. She can’t share her past. Ever. For too long, Jack’s protected his scarred heart by letting gold-digging women make him think love didn’t matter. But a sweet single mother and a soccer-crazy little boy change everything. He knows Melanie has secrets. Secrets she’ll have to share if he’s to help her realize she’s finally home. I’ve had lots of fun using Celtic mythology in my adult paranormal romances. The Magic Knot Fairies series is based on Celtic mythology along with other folk lore about fairies and mythological beings. With my latest release, I’ve returned to Celtic mythology, but this time, I’ve drawn on the ancient Celtic gods the pagans worshipped in Britain. One of these gods is Cernunnos, who is often represented in the UK as the Green Man. He is still celebrated by some here in the spring, and is supposedly responsible for the awakening of nature after winter. When the early Christians set about converting inhabitants of Britain from paganism to the Christian faith, one of the ways they attracted people into the new churches was by adopting pagan gods. In many old churches and cathedrals in the UK, one can find carvings of the green man’s face both on the outside and inside of the buildings. In Exeter Cathedral in Devon, there are many well known depictions of the green man. Some are beautiful, but some are also frightening, with vines and branches spewing from the green man’s mouth or body. Cernunnos caught my imagination when I was researching my Young Adult story, Wildwood, and the mythology and ancient pagan beliefs surrounding the god are at the heart of the story. A fifteen-year-old boy is sent to stay in a spooky English village with his grandfather for the summer vacation. He always knew he was different from other kids, he just didn’t realize how different until he discovers his father was linked to an ancient pagan cult. If he doesn’t get out of the village soon, he might never be able to leave. One of my great pleasures in writing a new story is researching the setting. If I’m really lucky I get to visit the place I plan to set my book. In pursuit of research, I’ve visited Ireland twice for my paranormal series, the Italian Amalfi coast, which features in a contemporary romance, Finally Home, due out from Carina in September, and the Island of Jersey in the English Channel for Unbreak My Heart. The setting research for my most recent release, Oceans Between Us, proved a bit of a challenge, as the story included so many places. It starts in London, then moves on to a small Cornish fishing village. I had no problem with these settings as I live in England. The action then goes to New York, a city I’d love to visit, but haven’t yet. I had to depend on the Internet for my research, and my son’s observations as he’d recently visited NY. My hero and heroine finally end up in his home town on the Italian Riviera in Riomaggiore one of five small towns that make up the Cinque Terre or five lands. 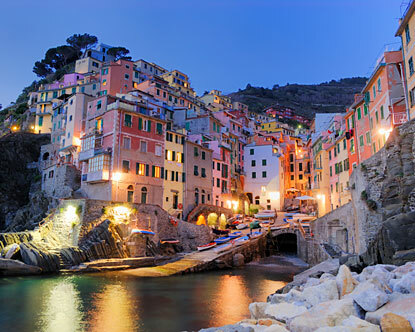 These are beautiful multicolored towns that are stacked precariously up the cliffs in small bays on the rocky coast. I would have loved to physically visit this area of Italy as it looks stunning, but time and finances didn’t give me the chance. Instead I turned to the internet again for details on Riomaggiore. What a treasure trove of information there is available to writers on the web! I even found a video shot by a tourist who’d walked around the town, giving a virtual tour. Let’s celebrate summer: time to kick back, relax, and read!!! than with Dozens of Great books that are FREE! Thrillers, Mysteries, Sci-Fi, Historical, Contemporary, YA, Children’s and more! Fantastic eBooks, many by award-winning and best-selling authors. Join in the Par-Tay! Let’s sizzle! I have a new book cover for Oceans Between Us. The talented Su Kopil from Earthly Charms designed it for me and she did a wonderful job.